In this exquisite deck, stylish characters breathe new life into the scenes and symbols of the Major and Minor Arcana. Dreaming Way Tarot explores numerological as well as elemental influences, and offers fresh interpretations of tarot. Popular Korean artist Kwon Shina expertly captured the exuberant spirit of Rome Choi’s dreamy vision. Dreaming Way Tarot was selected by Aeclectic Tarot readers as one of the Top Ten Decks Published in 2012. This RWS style deck is the work of Rome Choi and Kwon Shina. 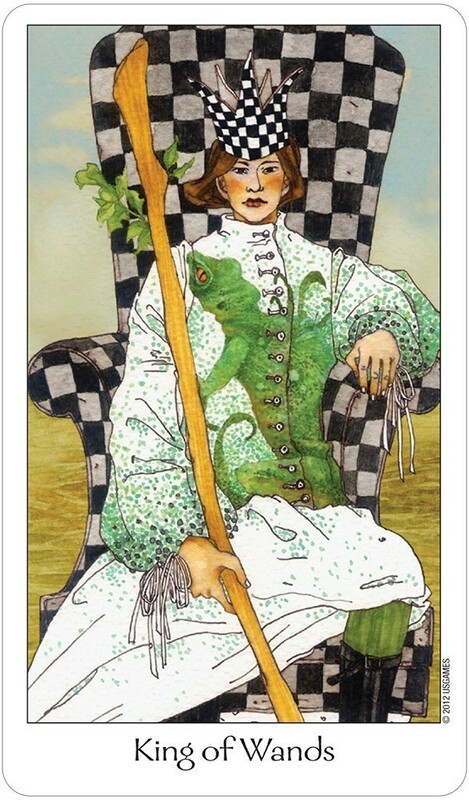 Directly from the box: "Dreaming Way Tarot dresses up traditional tarot with contemporary artistic flair. 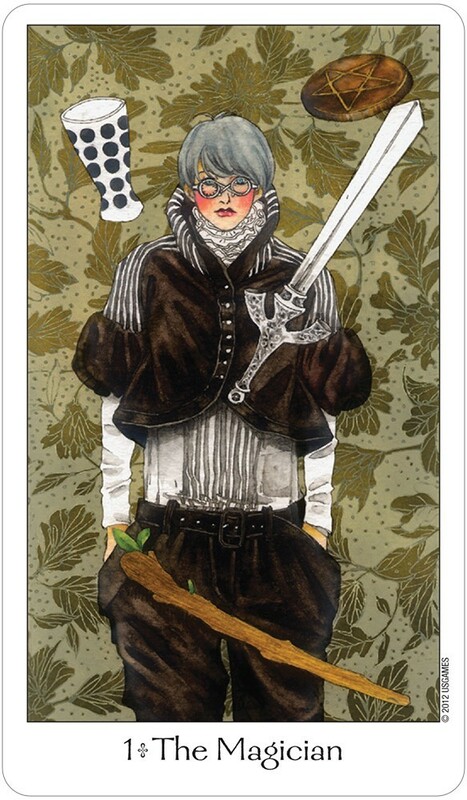 In this exquisite deck, stylish characters breathe new life into the scenes and symbols of the Major and Minor Arcana." I would agree -- this deck does demonstrate a modern flair. The artwork is strikingly modern and fun; it communicates a great deal with just the right amount of images and symbols. Suits are traditional: Cups, Pentacles, Wands and Swords, as are the names of the Trumps. Each card has a white border with the card title at the bottom in thin black text. The card descriptions in the LWB give both a short text about the card and what it represents as well as providing keywords for upright and reversed meanings. Additionally there are two short sections called "Characteristics of the Suits" and "Characteristics of Numbers" and a spread in the back of the LWB called "Dreaming Way Five-Card Spread," which is a spread designed to help the practitioner confront issues that may have blocked his or her contentment. The cards themselves are not as glossy as many of the cards by U.S. Games typically are, and I find that they handle even better as a result; they tend not to slide about at the slightest touch. 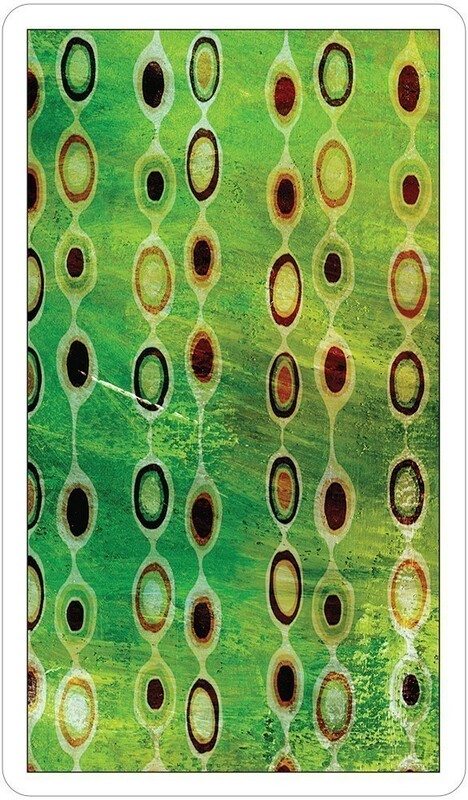 Cardbacks allow for reversals, as they are a Klimt-like array of circular orbs over a randomly painted green background. I find this deck to be pleasantly neutral on most accounts. There is no angst or darkness, nor is there excess of cute or cheery images. 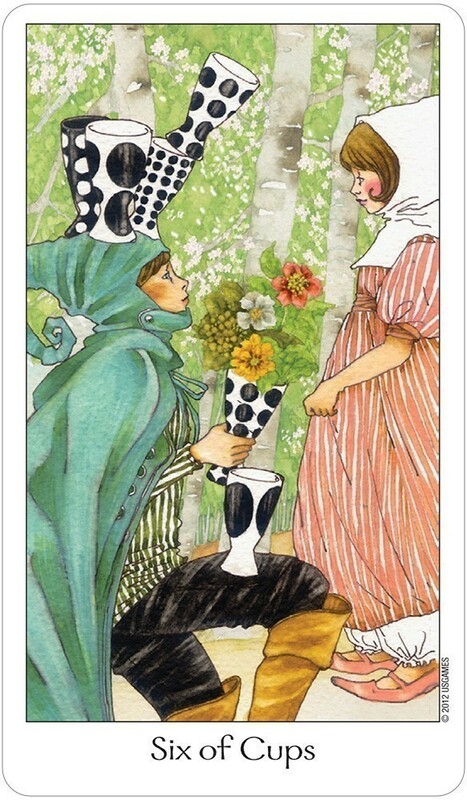 Characters in the scenes also have well-depicted, though neutral facial expressions, with the exception of a very few cards, such as the Ten of Cups. This is important for me, because often the facial expression can be a visual distraction, or a bias, when reading a card. Some of the fascinating card transformations in this deck include the Wheel of Fortune, Death, the Moon, Judgment, and the World. The Wheel of Fortune is almost certain to expand your card meaning once you see it: a woman employs a spinning wheel, meanwhile a long cord full of tangles and knots twists its way through the wheel. The woman has wings, and her face is serene and expressionless. On the Death card, all that is presented is a female, profile left, in a black gown and holding a scythe with the blade upright. All the colors on the card are dark. 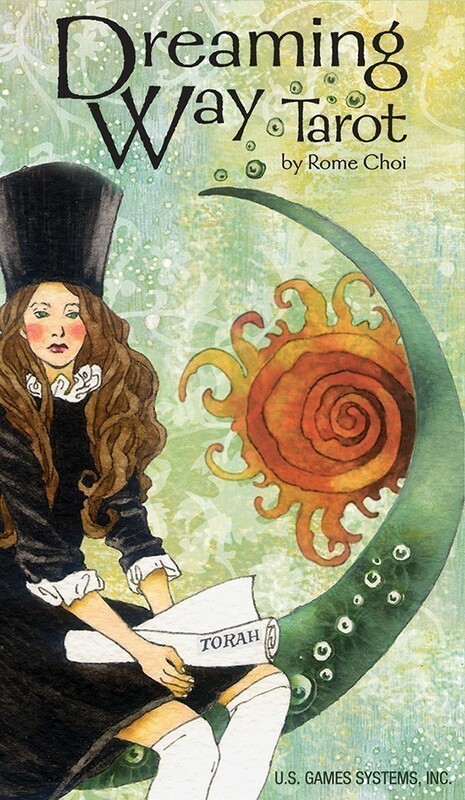 In the Moon card, a girl holds a lobster by the claws with only a huge moon as the backdrop. On the Judgment card we see only trumpeting angels -- no human figures responding to the trumpets as in the traditional RWS. The World card bears the least resemblance to the original, and yet this might be my favorite card in the whole deck: an aged man rests peacefully in a chair, clutching a pipe, a book and reading glasses in his lap. Behind him stand a tree covered in ivy. I would recommend this deck to readers of any level, as the images are easily understood and yet provide fertile ground for expanded meanings and intuitive reading. "Based on the traditional Rider-Waite tarot deck, the Dreaming Way Tarot builds on standard images and interpretations, adding emotional insight, whimsy, and creativity. The characters in this deck literally presented themselves to Rome Choi in a dream. He relied on his years of tarot research, numerology, and his study of Transpersonal Psychology to flesh out the deck. Kwon Shina captures Choi's original inspiration in her energetic, sometimes tongue-in-cheek, illustrations. Together Choi and Shina have created a unique deck, which preserves the roots of traditional tarot without simply repeating what's been done in the past. Beginners will be drawn into the cards, finding lots of visual cues to jumpstart their readings. Seasoned readers will be amused, stimulated, and prodded to look deeper into familiar symbolism. This deck is a treat for the eyes, which also provides plenty to think about." "Although the deck follows the RWS symbol pattern, the combination of artistic media, color palette, and the diversity of the figures results in a deck that’s light-hearted and unique. The booklet includes traditional card meanings, but there are some surprises for readers. The booklet also provides a unique analysis of the Minor Arcana in terms of the body, mind and soul, followed by a summary of the mystical meanings of the numbers one through ten and the general roles of the four court cards. The Page of Cups is a good example of the deck's great sense of humor. The young girl featured in the card has a teapot tied to her head. She looks a uncertain and perhaps a bit worried, as though she can’t quite figure out what to say or how to react. Three fish swim in front of her, a clever symbol of how this Page processes everything through her emotions and tends to be oversensitive to her environment. And the teapot shows how this Page can be somewhat leaky, weeping at the slightest emotional tremor. The Five of Wands is another card that’s powerful but funny. In the scene on the card, a group of young boys are sitting around a table. It looks like they're at a birthday party, and are wearing festive party hats. But something has gone horribly wrong! The boys are misbehaving. Somebody taunted or insulted somebody else, and a fight has ensued. One kid is ducking in the back, trying to avoid getting hit. The kid with the red vest looks like he intends to get his own way, no matter what! The imagery on the cards is attractive and begs for further exploration. The sensibility of this deck will appeal to younger readers who are fond of manga, animé and graphic novels, as well as to older readers who want a fresh take on the RWS images. The multi-cultural characters, the mix of East-West styling, the creative use of patterns (like the checkerboard in the Five of Wands), and the unfamiliar juxtaposition of color families tantalize the eye. Sweet!" The Dreaming Way Tarot brings to mind illustrations from a vintage children's book. It has a dreamy, gentle quality about it. The images have a nostalgic feel to them and seem almost familiar. I really love the style of artwork in this deck, and the contemporary, whimsical clothing fashion that adorns the characters. Oddly, there aren't very many joyous feeling cards in the bunch... everyone seems to sport a pretty serious expression. My favorite suit in this deck is the Cups. I love the black and white cups, and how they boldly contrast with the dreamy quality of the rest of the artwork. It's so different and unique, I think it's fantastic. The vibrant checkered patterns in some of the Wands cards have a similar effect. The Aces are gorgeous in their simplicity. The Death card is exquisite. A young woman in a black dress holds a scythe. It is simple and elegant. One of my favorite cards in the deck. 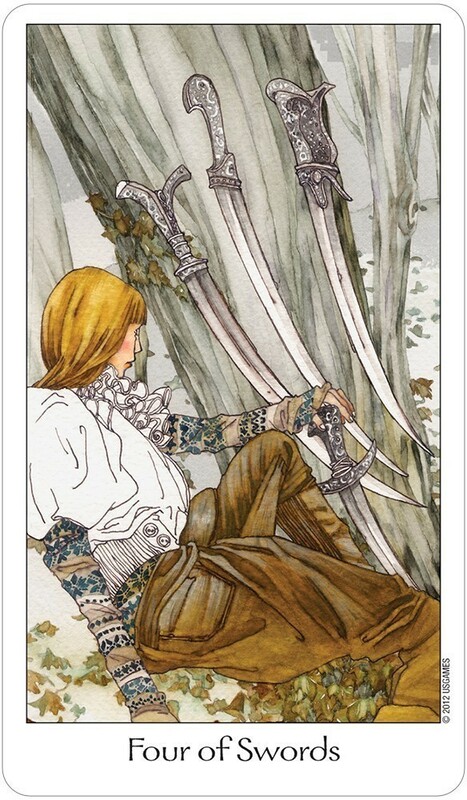 This deck has what is probably my favorite rendition of the Two of Wands. Usually this is a "meh" card for me, but this one is very interesting. The figure is looking out at two worlds, the one he is on, and another one up above, upside down. The one upside down doesn't appear to be as inhabited as this one, so it brings to mind the unlimited possibilities of those who dare to dream far and wide. 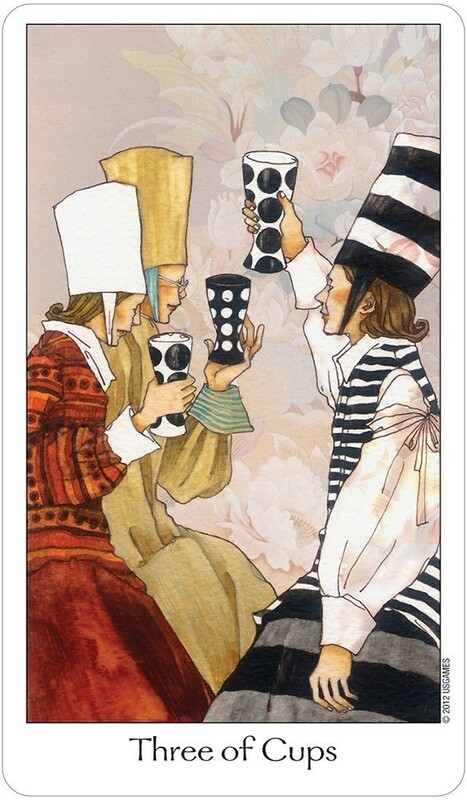 Whenever I come across the Eight of Cups, it's hard for me to look away. Something about her outfit mesmerizes me. I can see the wind blowing and making her dress bubble up behind her. I love looking at this card. It makes me want to follow her, which is a great way to feel about this card. You're supposed to move on in her direction when this card comes up. I like the motherly touches in the Queen of Cups, who has a child sitting next to her, and the Queen of Pentacles, who is holding a baby. The Devil is very interesting, as it is portrayed by a cute young woman, shackled herself, but still in control of the chains that bind her subjects. She has horns and wings... it's a beautiful illustration. But it's certainly not a scary Devil card. The Five of Wands is a card that hasn't come up for me yet in a reading, but when I see it in the deck, I hurry past it. The main boy's expression is so weird to me. Something about his nose and mouth, almost like he's deliberately making a funny face, but he's not. 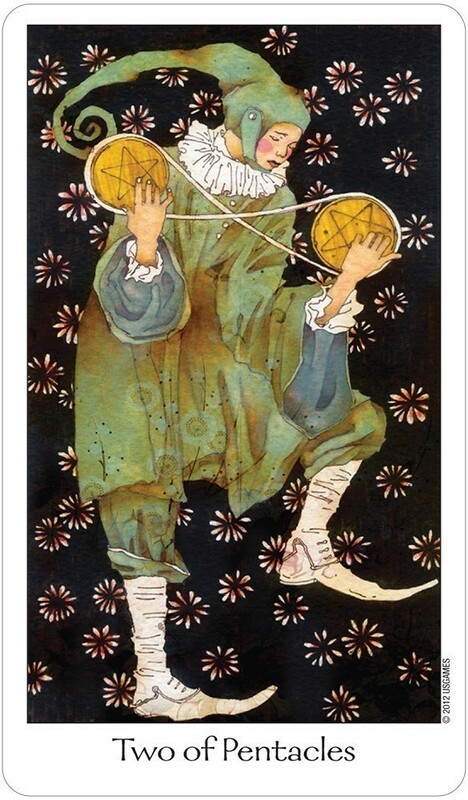 The Ten of Pentacles is bizarre too. There are four figures, clustered together, facing the same direction. It's hard to make out where the two middle people separate, unless I look very closely. I'm left wondering what these four have to do with anything. But overall, the imagery in the deck is quite charming. In fact, while I am typing up this reading, I have just noticed something that I didn't notice before in one of the cards. The Four of Cups is another card I really like in this deck, but I wasn't going to mention it until this thing caught my eye. I just noticed that there are three daisies in the card, but they look for all the world to be photographs, compared with the lines of the other drawings in the card. I am staring and staring at this card and I can't figure it out! It is most curious! It almost looks like real life is poking through into a dream. Like that in-between state between dreaming and waking, when you hear something in the real world, but it plays out in your dream. This card even came up in a reading for a client this week, and I never even saw the daisies! I have found this deck to read clearly and concisely. It works well to spark intuition, and can also be quite literal. It would be a great deck for storytelling and readings where you allow your imagination to wander and take you to places where you can use metaphorical references. It is easy to see a story unfolding in the imagery of the cards, and they blend together seamlessly. I did find it interesting, as much as I like this deck, that I only chose it to read for certain clients this week. I didn't select it for any of my male clients, as the cards feel heavily feminine to me. And I also chose in favor of another deck when I read for a client who was feeling very downhearted. Looking through the deck, it does have a hint of melancholy to it, so I passed on this deck when I was looking for a decidedly more uplifting vibe. But when I did read with it, I found it to be lovely and charming, whimsical and honest. 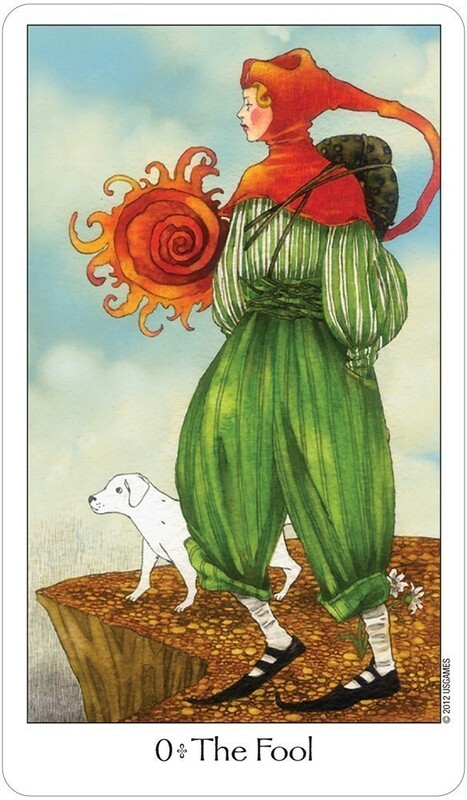 The artwork in this deck is beautiful and it lends itself well to intuitive readings. The matte finish is quite nice, so the cards themselves are pleasant to work with. It's one of the most interesting and attractive decks I've seen published in quite awhile. A definite keeper and one that will remain in my regular rotation of reading decks.